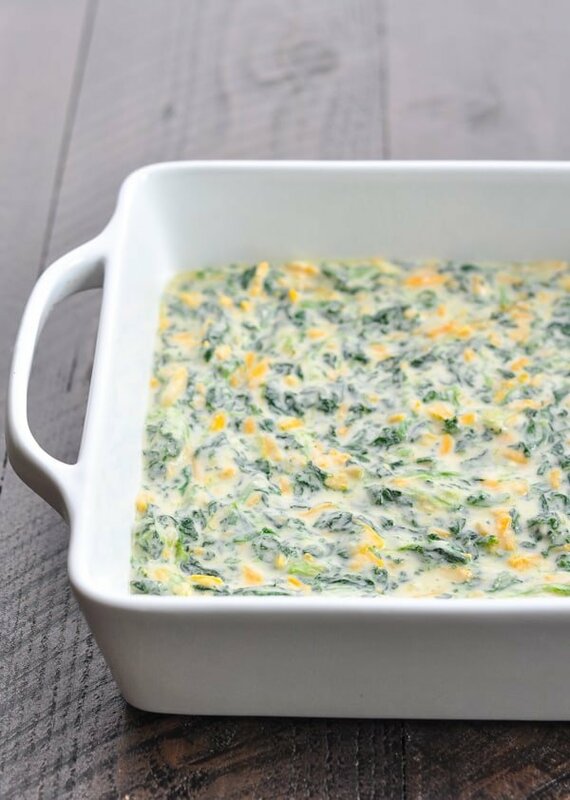 Aunt Bee's Cheesy Spinach Squares are an easy make ahead appetizer to serve at your upcoming holiday party! 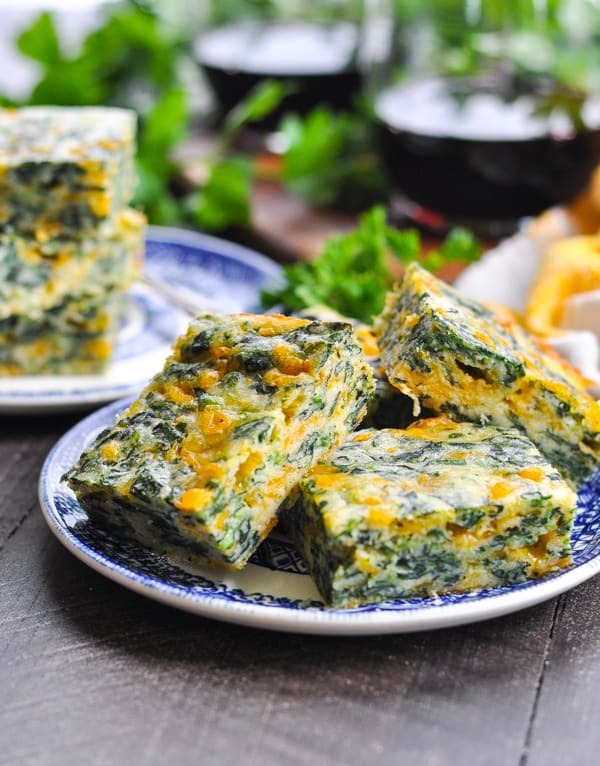 Aunt Bee’s Cheesy Spinach Squares are a delicious make ahead appetizer to serve at your upcoming holiday party! They are the perfect bite-size finger food, but they work equally well as a weeknight side dish. Cheesy, easy and just 10 minutes of prep — how can you go wrong? When Aunt Bee originally sent me the handwritten index card with this recipe on it, the title was called “Spinach Brownies.” I immediately envisioned some weird concoction of chocolate and leafy greens, but boy was I wrong! This is a recipe that dates back to the days when it was not en vogue to hide your veggies in dessert treats, or to lighten up a dish with “secret” ingredients like chickpeas or kale. Instead, I suppose they were called “brownies” because you can bake them in a square pan and slice them just like you would a more traditional brownie. But the similarities stop there (fortunately!). 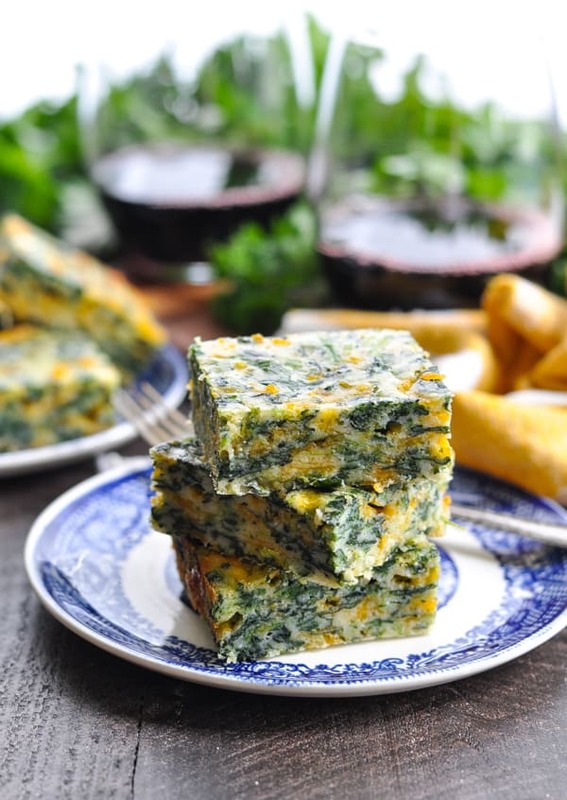 Instead of some odd chocolate-spinach blend, these are actually just a very simple savory recipe for spinach and cheese squares that can be prepped in a matter of minutes, baked, and even frozen until you’re ready to enjoy them. They are great make ahead hors d’oeuvres because they can be sliced into very small bite-size squares, they don’t make a mess, and they taste great either warm or at room temp. And did I mention that you can make them in advance?! This is SO simple, y’all! It’s really just a matter of stirring together a few ingredients and baking them in the oven. That’s it! So let’s start with the spinach. I use a box of frozen chopped spinach, which I can cook in the microwave in about 5 minutes. Very important tip, though: make sure that you place the cooked spinach in a dish towel and SQUEEZE it dry. You want to get as much water out as possible before adding the spinach to your bars. Another little tip: I find that hand-grating the cheese (which only takes a minute or two) is far better than using the bagged stuff in this recipe. The block of cheese just melts much smoother than the pre-shredded version. Then, as I mentioned, you just stir everything together! Transfer the batter to a 9-inch square baking dish, and pop it in the oven for about 30 minutes. 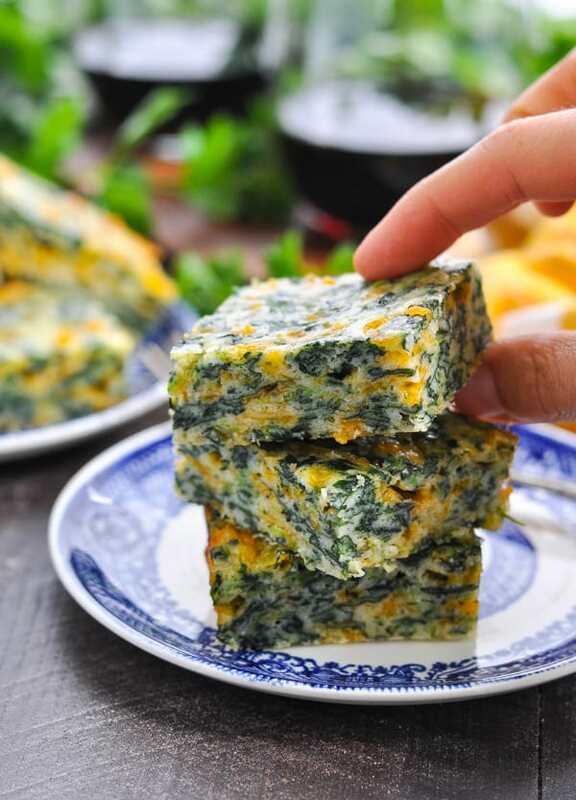 Allow the spinach squares to cool slightly before slicing and serving! Can you freeze spinach squares? Yes! This make ahead appetizer can be baked in advance, and then wrapped tightly and frozen for up to 2 months. 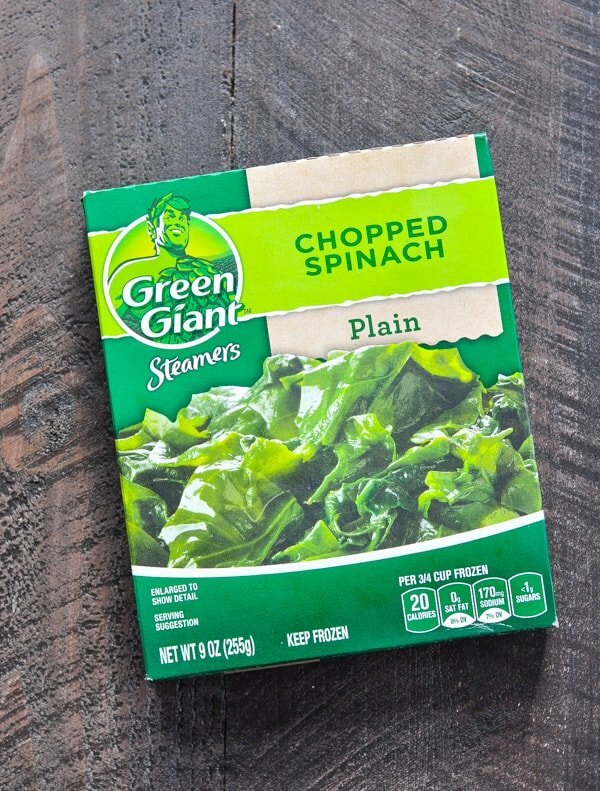 To reheat frozen spinach squares, place the frozen squares in a 400-degree F oven for about 20 minutes. 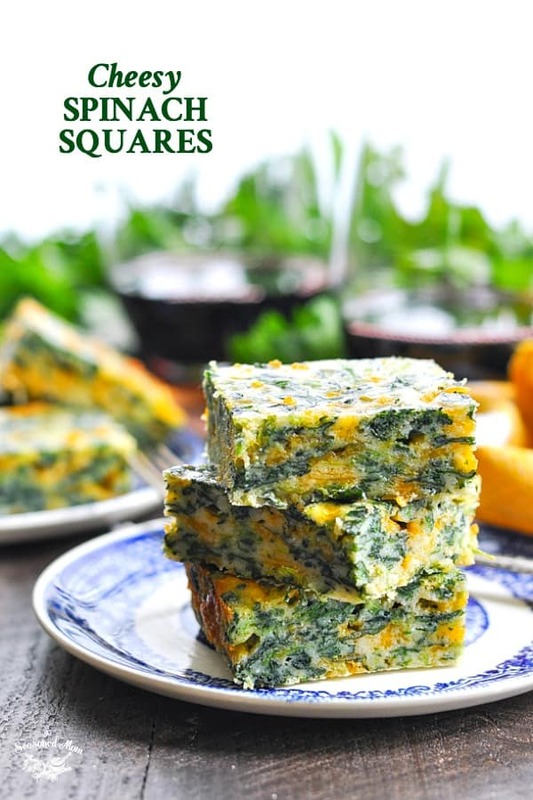 The spinach squares are delicious when served warm or at room temperature, so they’re great for setting out at a party. You don’t have to worry about keeping them warm! They’re also not messy or hard to eat, so your guests will thank you! They can grab a Cheesy Spinach Square in one hand and hold a glass of wine in the other! Cheers! Serving a larger crowd? 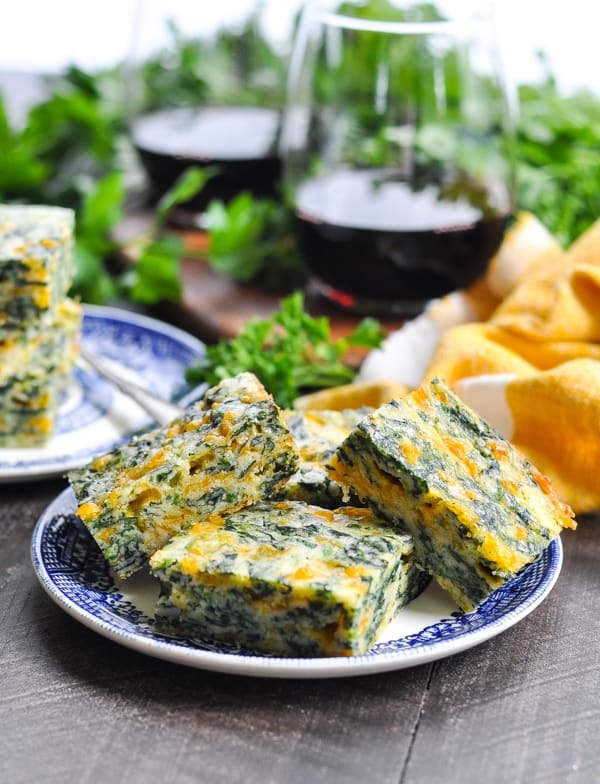 Double the recipe and bake the spinach squares in a 9 x 13-inch dish. Be sure that the spinach is squeezed very dry before adding it to the rest of the ingredients. To do so, I like to place the cooked spinach in a dish towel and wring it out over the sink. You’ll be amazed by how much water comes out! 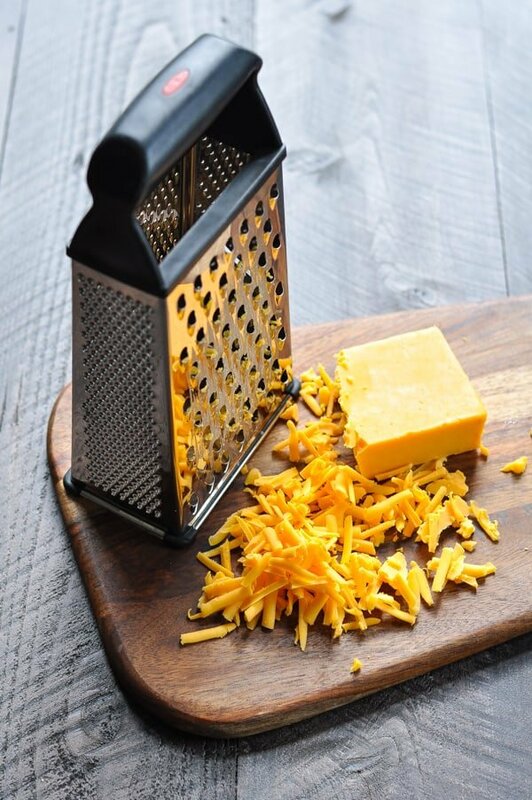 Grate the cheese by hand, rather than purchasing a package of pre-shredded cheese. This extra step is worth the effort, since the hand-grated cheese melts better (and tastes better)! If freezing the squares, be sure to allow them to cool completely before wrapping. Want to use fresh spinach instead of frozen chopped spinach? I have never prepared the recipe with fresh spinach myself, but a reader has tested it and commented below. See her note if you’d like to give it a try! Mix all ingredients together. Place mixture in a greased 9-inch square pan. Loosen edges from sides of pan as soon as they are removed from the oven. Cool slightly before cutting into squares. Serve warm, or freeze to use later. If using frozen squares, reheat at 400 degrees for about 20 minutes (or until heated through). 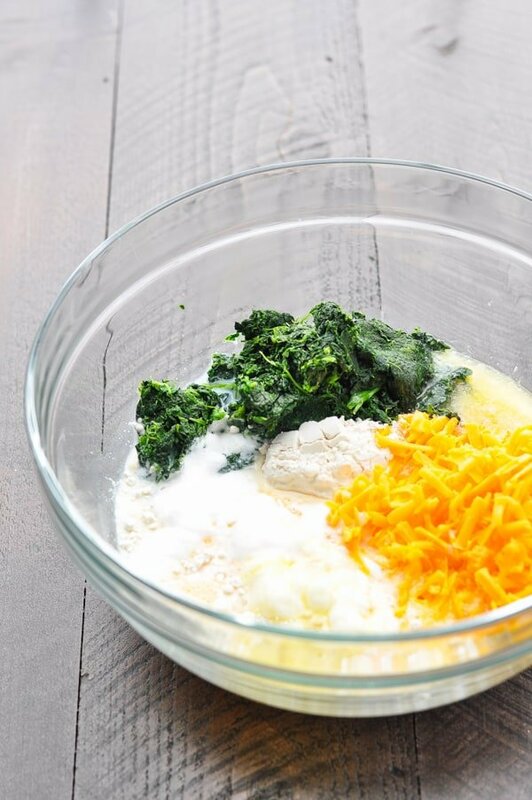 Be sure that the spinach is squeezed very dry before adding it to the rest of the ingredients. To do so, I like to place the cooked spinach in a dish towel and wring it out over the sink. You'll be amazed by how much water comes out! Want to use fresh spinach instead of frozen chopped spinach? I have never prepared the recipe with fresh spinach myself, but a reader has tested it and commented below. See her note if you'd like to give it a try! This post was originally published in November, 2014. It was updated in November, 2018. 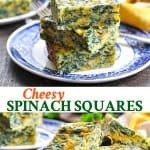 Gosh, these little squares of spinach and cheese look just delightful! What’s more, we know very well that if something comes from Aunt Bee there is no other way! Thanks for sharing these, now if I could just bite into one! Hah! Thanks so much for stopping by, Dan. You’re right — Aunt Bee knows her stuff! These look fabulous and so simple to make! This looks so easy to make and so yummy too! Visiting from Link-a-palooza! Oh it looks sooooooooo inviting!! Thanks, Winnie! 🙂 I love that flavor combo, too! Hi what dat percent milk did you use? Have you tried different ones and how were the results? Thanks! Hi Blair! 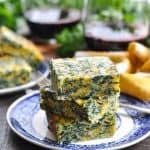 I only ever use fresh spinach when making these squares and I just toss it right into the mix – no pre-cooking required! I usually use almost an entire plastic carton of the organic baby spinach and I find that works just perfectly. Thank you, Melissa for the tip on the substitution of fresh spinach!! Have you ever made this with fresh spinach? I have a lot to use, but not sure if I should cook it first or use it raw in the recipe. How are these at room temperature? I need to make this and ay in advance for an appetizers and dessert party I won’t be able to rehear for the party. Will they be edible at room temp? Hi, Patsy! They are great at room temperature! Is there a way to make these with green Chile’s to have them be Mexican flavored? They tasted like flour with a hint of cheese. No evidence of eggs or salt. I made them for a breakfast pot lock and had to go out and buy donuts in the morning instead of bringing the spinach squares. Always best to go adjust to your own taste. The second t8me I made them, I included a much stronger mix of cheese (with Asiago). Delicious! Plus I used broccoli stems and cauliflower leaves, chopped up in the food processor and then drained through a sieve to get rid of the excess water. Just as yummy as the spinach, and that’s saying something! Loved the recipe and the flexibility of it. Thanks!